Apple is using its weight in the music industry to push major record labels into pressuring streaming services like Spotify to abandon their free streaming deals, The Verge reports. 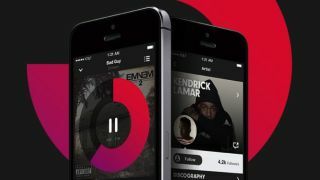 This move would slim the competition for Apple's anticipated relaunch of the Beats Music service, but has reportedly garnered the scrutiny of the United States Department of Justice. The DOJ has already begun interviewing several important music officials, the report said. Spotify is the largest subscription music streaming service, with over 60 million subscribers. However, only 15 million of those pay up each month, making Apple's upcoming competitive streaming service even more to dangerous to Spotify. That is, if the record labels don't renew their licenses for free music. Apple has also, according to the report, offered to pay YouTube's music licensing fee to Universal Music Group if the label stops putting its songs on the site. Because of Apple's slow entry into the arena of music streaming, it appears to be trying to clear the field before its grand entrance. One unnamed music industry source said, "All the way up to Tim Cook, these guys are cutthroat." With download numbers consistently falling because of companies like Spotify, it makes sense that Apple would want to throw its hat in the ring. While Cupertino has been behind the times on subscription-based music, it may succeed in choking off Spotify's free music, which was meant to be a gateway to paid subscription. Instead, free streaming has been a thorn in the sides of labels and Taylor Swift alike.